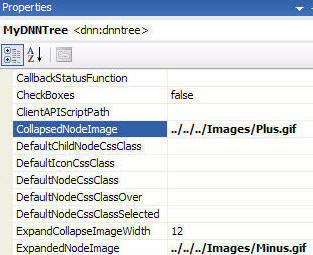 The DNNTree control will display items in an expandable tree. This is a very complex and customizable control and has extensive documentation that is provided to fully explore it's features. The example at http://webcontrols.dotnetnuke.com shows how the control can be used to dynamically build a file manager (you can download the source here). This is a brief introduction to the control to show how easy it is to get it up and running. In this example the control will be used to create a list of websites that you can click on to take you to the particular site. Here are the steps to implement this web control in your own modules. This works with the full version of Visual Studio 2005 and also Visual Web Developer Express. Use the Browse button to browse to DotNetNuke.WebControls.dll (in the /bin folder of your DotNetNuke installation) and click the OK button. Drag the DNNTree control from the toolbox and drop it on to your DotNetNuke User Control (See my tutorial Creating a Super-Simple DotNetNuke module for information on how to create a DotNetNuke User Control). In the properties for the control, change the ID property to "MyDNNTree". Under the properties, change the CollapsedNodeImage to "../../../Images/Plus.gif" and ExpandedNodeImage to "../../../Images/Minus.gif"
objNode.ToolTip = "DotNetNuke Tutorial Series"
objNode.ToolTip = "DotNetNuke 4 Tutorials"
objTreeNode.Text = "Super-Simple Module (DAL+)"
objTreeNode.Text = "Super-Fast Super-Easy Module (DAL+)"
objTreeNode.Text = "Create a full complete Module"
We see that there are events that we can wireup a method to. Type "MyDNNTree_PopulateOnDemand" for the PopulateOnDemand event and click away from the box. Save the page and Build the page. 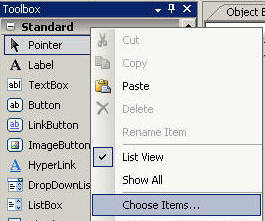 Notice that the tool tips appear when you hover your mouse over the folders. This example is so simple it really does not do the control justice. However, you can see that the control is just as easy to use as a Microsoft Atlas control. In addition, all of the web controls work with ASP.NET 1.1 and DotNetNuke 3. This is yet another example of why web development is faster and easier when you use the DotNetNuke Framework.